Establish the Reserve System. 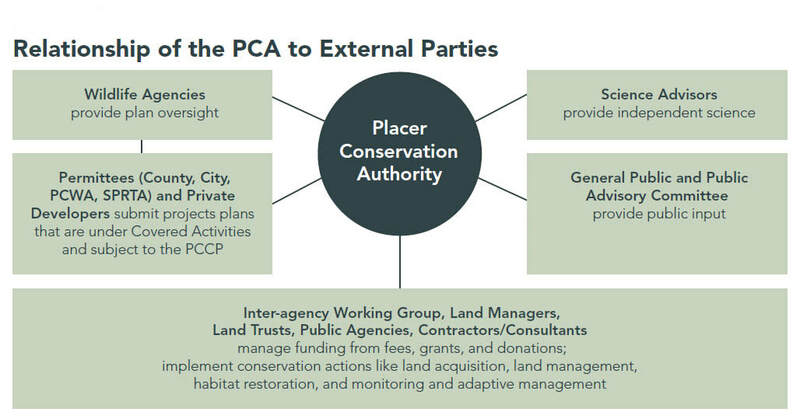 The PCA may hold title to lands or conservation easements it purchases and may enter into cooperative agreements with other land management entities to own or manage lands for the PCA as part of the Reserve System. Manage the Reserve System, overseeing planning and design, habitat restoration, monitoring, and management programs. Keep the account of take and mitigation. The PCA will receive documentation from the other Permittees on Covered Activities, track the amount of take coverage granted, the mitigation conditions applied, and the amount and payment schedule of development fees. Serve as the primary clearinghouse of resource data associated with implementation of the Plan. Coordinate with Wildlife Agencies on a regular basis and provide annual reports. Coordinate with science advisors, outside consultants, and land management agencies. Apply for and manage grants, contracts, and other funding sources. Hire staff and/or contract with existing local agencies, non-profit organizations, or private consultants to carry out its responsibilities. Stay-ahead and Jump Start. The benefits of the regional Reserve System will offset the adverse effects of loss of habitat to Covered Activities because assembly of the Reserve System will lead or “Stay-Ahead” of impacts – the PCA is required to preserve habitat faster than Covered Activities remove habitat. To meet the Stay-Ahead provision during the early phase, nearly 2,400 acres of existing conservation lands contributing to the biological goals and objectives of the PCCP already purchased by the County under the Placer Legacy program will be included in the Reserve System and will be counted toward Plan acquisition commitments in order to “jump start” implementation. Several already established and proposed conservation or mitigation banks may seek approval for credits to help meet Plan stay-ahead commitments, including purchase of California red-legged frog conservation credits at the Big Gun Conservation Bank east of Auburn.